Let’s talk decor. There are certain items that have become staples in my own home, and for spaces I’ve designed for clients. Those basics that bring the farmhouse charm we’re all nuts about, while delivering texture, interest, and a feeling of casual warmth. Isn’t that really what it’s all about these days? A house that doesn’t look “overdone” or contrived, but feels cozy and welcoming. I’m featuring a few of my favorite go-to items today, including links on where to find them! Grab a cup of coffee and let’s shop! #1 on my list. 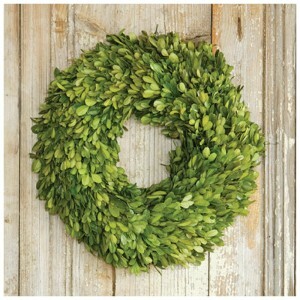 A boxwood wreath. It adds a soft, natural touch and a pop of fresh green to any color scheme, but really makes a neutral color palette sing. The uses are limitless: hang it on a door, an old window, a chalkboard, a mirror…it’s definitely a favorite and an essential decor item in the farmhouse style! You can find this one here. Next up, lighting. I’m always surprised at the lack of lamp lighting in people’s homes. This is a great way to bring warmth and coziness to any space. Now, step away from the overhead light switch, and try this little beauty instead. 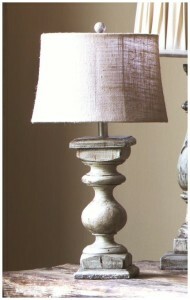 You can find the “Bohemian Shine Lamp” here. While we’re on the subject of lighting, why not swap out that dated 90’s chandelier for this industrial farmhouse piece? Lighting is like the jewelry in a room. A key finishing touch. And this guy? A total conversation piece! You can find “The Iron Horse” here. It’s no secret I have a love affair with baskets. This set of 3 is just the right color, they provide texture to the overall look of a room, and the storage opportunities are making me crazy. In a good way. You can find the “Kubu Basket Set” here. We can’t move on without talking about wire baskets. I mean, are you kidding? These. Are. So. Darling. In fact, excuse me while I go order some for myself. Style these up with some old books, a plant, and pop a little chalkboard tag on the front. Bam. Cutest vignette for your entry table. You can find the “Soul Sisters Baskets” here. What would a farmhouse be without a little cow art? This rustic metal cow is so cute, without being “cutesie.” Find the “Rustic Metal Cow Wall Hanging” here. Cutting boards are all the rage these days, and this one takes the cake. Or rather, the stuff you need to cut. 😉 I love the brass handle and the accent of white. Well, that’s no surprise coming from this white-kitchen-loving girl. Find the “Finlay Cutting Board” here. A galvanized metal tray? Ummm, yes. Use it to corral items on your kitchen counter, style it up on your coffee table with a pretty little topiary, some coasters, and your 13 remotes, or use it as a cute catch-all on your dresser top. You can find the “Gus” galvanized tray here. Last but not least, these “found” German wine crates. I love. These crates. Rustic, simple, and loaded with farmhouse charm. The German lettering on the side is making me want a soft pretzel. Or a day of shopping at Oktoberfest. Whichever. Find these “German Wine Crates” here. So there you have it. It’s always fun to add a little something new to the mix every now and then. Is there a little corner in YOUR house that could use a little attention? Do it! You’ll be smiling every time you walk by. What are your favorites? 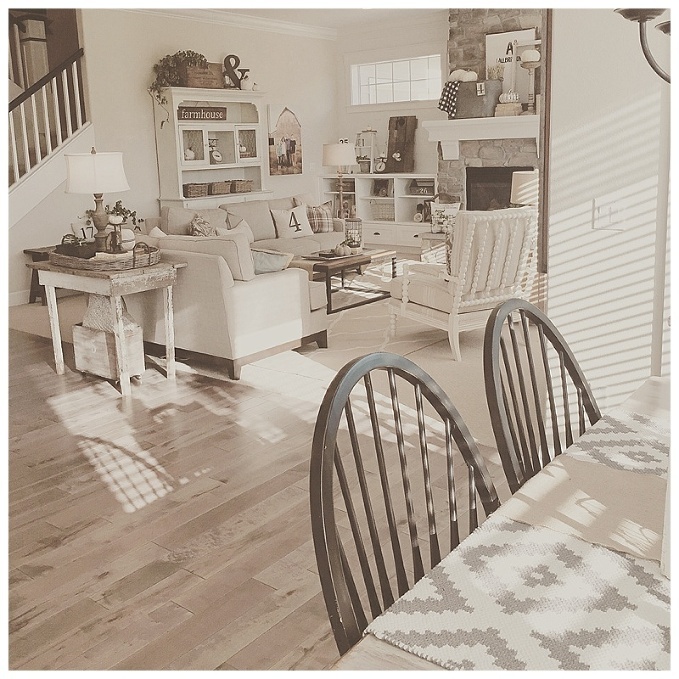 Is there something you consider a “go-to” in Farmhouse decorating? Tell us all about it in the comments below! Jane - Love Painted Fox, too. Another great source is Magnolia, owned by Joanna Gaines from HGTV. I found the delivery to be so much faster. Amber - Hi there. I love your website and style! I am going to build a barn door in our kitchen and wondered if you would share with me where you purchased your hardware for your barn door? It is exactly what I want! And I haven’t found anything similar to what you have!